Women and men looking for the highest quality, style, and function often turn to exclusive luggage to meet their travel needs. Utilizing travel bags and suitcases that aren't the run of the mill also means that these items stand out, allowing you to easily identify your luggage and reduce the risk of it being confused with another traveler's. You aren't like everyone else - why should your luggage be? Being selective when it comes to choosing luggage can pay off. Finding suitcases, travel totes, and other travel accessories that are unique can reflect your own sense of personal style, your tastes, and lifestyle. Carrying original luggage also reduces the risk of getting bags confused with other parties. Exclusive travel gear is typically of high quality, with manufacturers who are known for their attention to detail and careful craftsmanship. Artistry and embellishments may be done by hand, and designs may only be available in a limited selection. 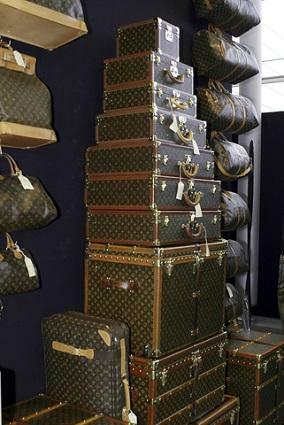 Many high end brands have high price tags on their luggage collections for the craftsmanship, materials, and designs. The issuing of limited edition, one of a kind, and exclusive items, however, also keeps coveted names from flooding the marketplace and often endears them even more to consumers loyal to the brand. While exclusive or limited edition luggage is often expensive, it isn't always the case. A restored vintage travel bag, for example, might have been an estate sale find that becomes your unique trademark travel case. While celebrities and wealthy individuals often carry exclusive suitcases, consumers with less than star status can also have luggage that's out of the ordinary with a little digging. Check out pre-owned exclusives from auction sites like eBay, outlet store finds, and unique luggage from specialty stores to widen your options when it comes to luxury travel totes. Many of the top names in handbags also carry exclusive luggage lines. Let's look at some of the most coveted travel collections available. One of the most exclusive types of luggage available, HENK offers the ultimate in luggage luxury. The collection currently includes the Travelfriend and the HENK Attaché Case. Ready to ship and limited edition HENK luggage uses materials such as Madagascar ebony, horsehair, high tech fabrics, Italian redwood, and calfskin with a carbon fiber shell. With over 500 components, hidden cases, and retractable titanium wheels, the Travelfriend offers sleek style and incredible convenience. You can also order custom suitcases or attaché cases from HENK. Luggage is available starting at fifteen thousand dollars and up from select European dealers. For more information, visit www.henk.com. Louis Vuitton (LV) began manufacturing trunks in the late 1800s in Paris, and while LV handbags are now beloved by women everywhere for the stylish designs and high quality, and it's no wonder that Louis Vuitton luggage is also coveted with their continued tradition of excellence. From approximately one thousand dollars for a keepall or travel bag to over six thousand dollars for the Alzer 80 monogram canvas suitcase, Louis Vuitton has a range of beautiful travel bags and luggage. Louis Vuitton also entertains approximately four hundred and fifty custom requests per year, so you can have the ultimate exclusive in designer luxury if you're willing to pay the price. For more, visit www.louisvuitton.com. One of the finest names in luxury handbag and accessories, Gucci luggage is another exclusive brand. Ranging from approximately five hundred dollars for a travel tote or carry on case to over three thousand dollars for a trolley suitcase, Gucci offers quality and style for the discerning traveler. Specific limited edition items are also released periodically form Gucci, such as the exclusive two piece La Pelle Guccissima. This set consists of a leather travel duffel and messenger, designed to reflect the Beijing Olympic theme and will be sold in Gucci boutiques in China and Hong Kong. For more on this or other limited edition Gucci luggage, visit www.gucci.com.